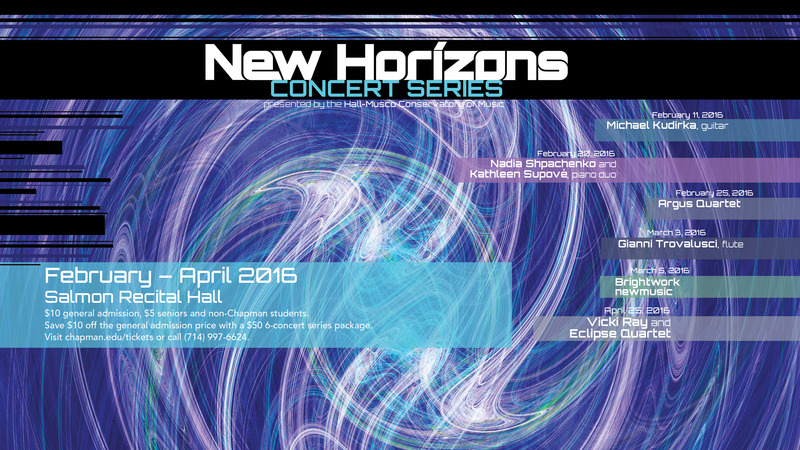 Chapman University’s Hall-Musco Conservatory of Music is pleased to announce the 2016 New Horizons Concert Series, which features performances by six leading contemporary music soloists and ensembles. 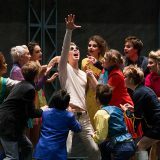 or call the CoPA box office ticket hotline at (714) 997-6624. 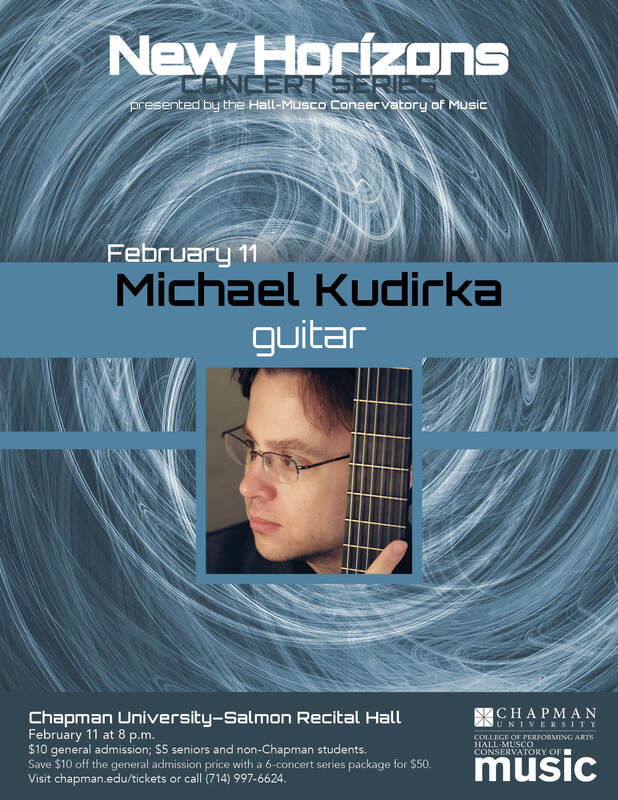 February 11, 2016 – Michael Kudirka, guitar Acclaimed guitarist Michael Kudirka, along with special guests Tara Schwab, Mark Menzies, and The CalArts New Century Players, will perform recent works by Chapman University composers Sean Heim and Jeffrey Holmes as well as Chancellor Fellow: Senior Composer in Residence, Chinary Ung. 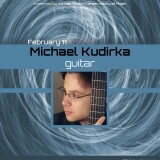 Works by Los Angeles-area Miroslav Tadić will also be featured on this compelling program of new music for guitar. 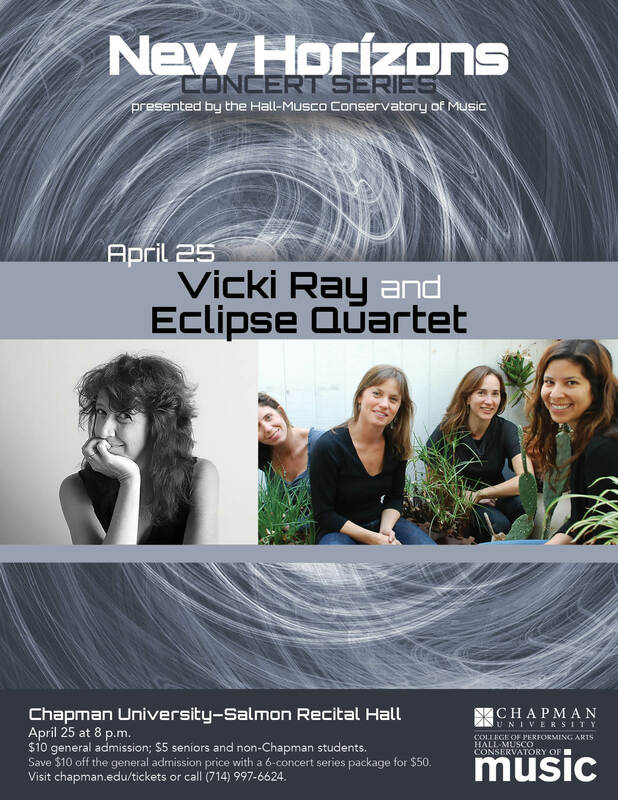 Two pianists from opposite coasts bring together their passion for new piano music in this concert titled “Quotations and Homages.” Grammy®-nominated pianist Nadia Shpachenko performs works by Missy Mazzoli and Chapman’s own Vera Ivanova based on her newest recording project of the same name. 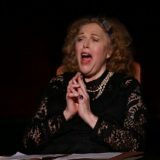 Kathleen Supové brings quotations and tributes in the form of works by Randall Woolf and others from her Digital Debussy project and recording. Together, they premiere a 2-piano work by Los Angeles composer Jack Van Zandt, as well as the winner of American Composers Forum LA/Chapman’s open call for piano duo scores. This concert is supported in part by the ACF/LA. 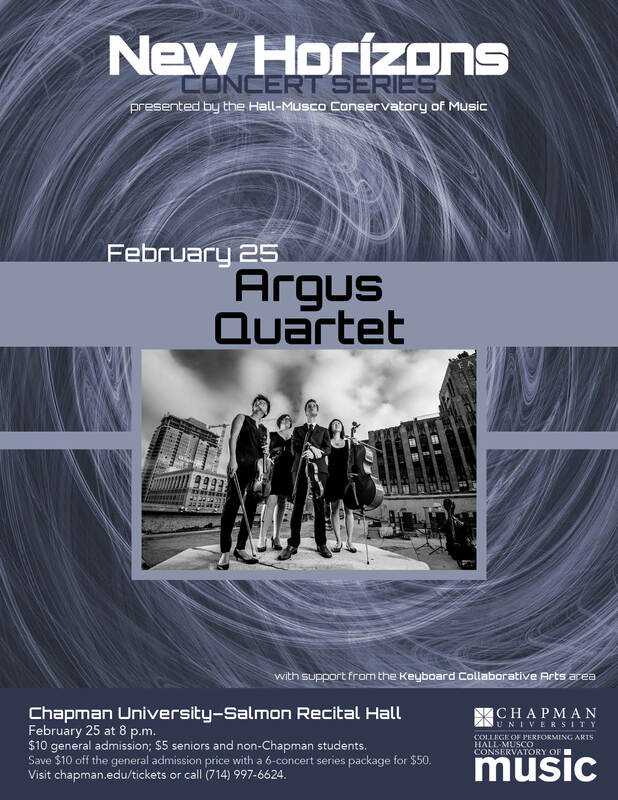 The Argus Quartet is deeply committed to the music of our time, and works by living composers make up a large part of their repertoire. As such, the quartet is pleased to present the Chapman community with a preview performance of their upcoming Boston Court Performing Arts Center concert, featuring selections from recently penned works by composers Eve Beglerian, Gabriela Frank, Nick Norton, Kaija Saariaho, and Chapman faculty member Ben Phelps. 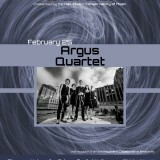 Trumpeter Adam Bhatia will join them for the performance of movements from Phelps’ quintet, The Angels. 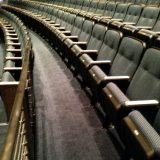 This concert is made possible through the generous support of Chapman’s Keyboard Collaborative Arts area. Beginning in the middle of the 20th century, the flute has become an important medium in the field of Contemporary Music, contributing to a musical revolution destined to change both composition and interpretation and to alter the very idea of musical language. 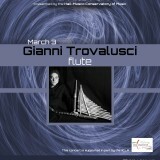 In this recital, Italian flutist Gianni Trovalusci will present an exciting selection of contemporary music for flute, with and without live electronics. This concert is presented in collaboration with the Italian Cultural Institute, Los Angeles (IICLA). 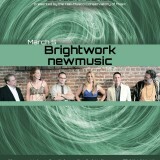 Brightwork newmusic, the flexible and fearless sextet based in Los Angeles, focuses on playing the best music that’s being written today, while continuing to play the classics of “new” music from the last hundred years. 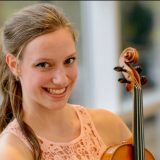 The ensemble, which includes Chapman’s director of percussion studies Nick Terry, will perform works by Rome Prize winner Chris Cerrone, Benjamin Broening, Panayiotis Kokoras, and Pulitzer and Grammy–winning composer John Luther Adams. 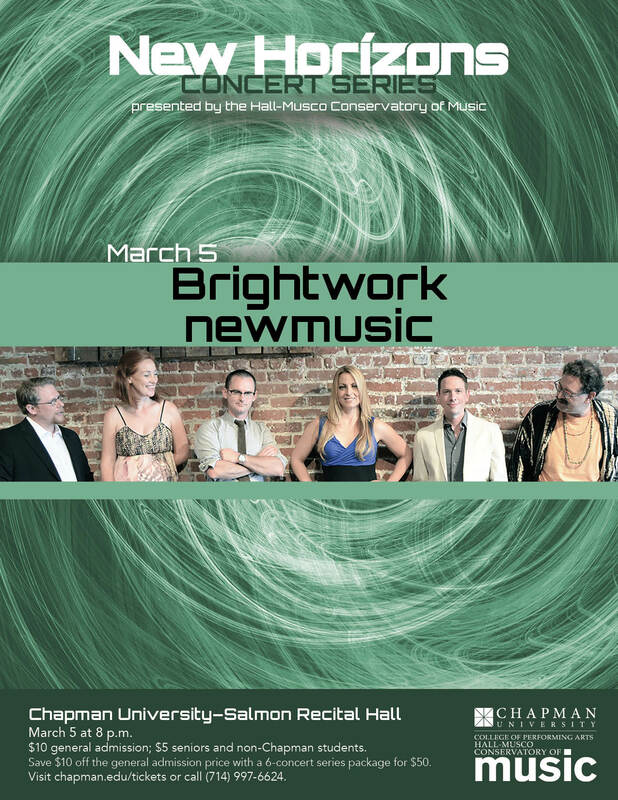 Also on the program is a new work written specifically for the ensemble by Southern California’s own Tom Flaherty. What the listener can expect at a Brightwork concert – at the very least – is exciting, emotionally engaging music presented in state-of-the-art performances as they seek to draw the audience into the creative process. 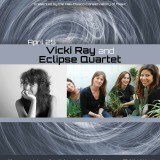 Grammy–nominated pianist Vicki Ray, one of today’s most “phenomenal and fearless” interpreters of contemporary piano music, will be joined by the equally celebrated Eclipse Quartet to perform Chapman professor Sean Heim’s compositional tour-de-force, Standing in the Storm of Time, along with other seminal works from the twenty-first century. 40 people shared or liked this.